This year marks a number of noteworthy anniversaries, among them some of the most inspiring (the Apollo 11 moon landing) and), and tragic (Tiananmen Square) episodes in modern history. On a more esoteric level, this year represents the 20th anniversary of a largely forgotten but significant event in the annals of video game industry. On August 29, 1989 the Japanese computer manufacturer NEC released its video game console, the Turbo Grafx-16, in the United States. No doubt gamers under the age of 25 uttered a collective "Huh?" after reading the previous sentence. What’s the Turbo Grafx-16? What made it so special, and why are veteran gamers still obsessing over it? The answers to those questions are understandably varied. For some, the Turbo Grafx-16 (TG-16) is a nostalgic trip back to a simpler era, one where their chief concerns were beating Bonk’s Revenge and obtaining the most colorful slap bracelet on the playground. For others, the TG-16 is a historical oddity that possessed entertaining, exclusive games that deserved better. At the end of the day, the TG-16’s tragic tale of wasted potential best serves as a lesson to nascent video game developers on what not to do when releasing a new console in the American market. In 1987, NEC and video game developer Hudson Soft teamed up to create a video game console. The offspring of this venture, the PC Engine, became quite popular in Japan, with consumers buying more PC Engines than Famicons in 1988 (Famicon being the Japanese version of the Nintendo Entertainment System). On the back of this success, NEC decided to bring the PC Engine to North American shores, renaming it the Turbo Grafx-16. The 16 in the name represented NEC marketing the TG-16 as 16-bit, but this claim was only partially true. While the TG-16 possessed a 16-bit graphics card that could display approximately 256 colors on screen, compared to the 64 of the Sega Genesis, the TG-16’s brain was actually just an 8-bit processor. This meant the system was really an 8-bit/16-bit hybrid, making it an evolutionary intermediary between the 8-bit NES and a true 16-bit system like the Super Nintendo. The console itself was small, black, and rectangular in shape. Following the adage of ’if it ain’t broke, don’t fix it’, the TG-16 closely emulated the NES and its controllers. The TG-16 controller, the TurboPad, consisted of a directional pad, and two main buttons labeled I and II. It also had two turbo switches that, when toggled, allowed rapid fire. This last function was quite helpful for shooters like the aforementioned R-Type and other games that required a high degree of sustained action. One of the most memorable aspects of the TG-16 is that it used HuCards instead of cartridges. These were small, wallet-sized plastic cards that held game data. The TG-16 also has the distinction of being the first console with an optional CD add-on, the Turbo Grafx-CD. This peripheral allowed gamers to hear CD-quality sound for the first time in console gaming, which was quite the achievement. It’s arguable that The TG-16 is still the best console to date for fans of shoot-em-ups or ’shmups’. It featured an impressive line-up of shmups including Blazing Lazers, Super Star Soldier, and a near arcade perfect translation of R-Type. Hudson Soft also thoroughly supported the system with games like New Adventure Island and Bomberman ’93. Many older gamers will remember a certain caveman with a killer headbutt; Bonk, the system’s mascot, was the star of three games on the TG-16. The series also spawned a spin-off shooter, Air Zonk. The system also possessed a variety of cult, niche titles including the strategy game Military Madness and the horror-themed beat-em-up Splatterhouse. The Turbo Grafx CD expansion, while possessing a scant library, featured some notable titles. Gates of Thunder and its sequel, Lords of Thunder, are considered to be great shooters with terrific CD-quality soundtracks. Role-playing game Ys: Book I & II is another highlight of the system. Unlike today’s disc-based systems, the Turbo Grafx CD did not have a regional lockout. This meant that the import market was quite accessible for those industrious enough to pursue it, bearing in mind this was quite some time before the Internet became mainstream. Castlevania: Rondo of Blood is perhaps the most well known import for the system. Rondo is the last installment of the Castlevania series to focus on pure, straightforward action. As most fans know, after the success of Castlevania: Symphony of the Night (1997), the series would come to adopt RPGs elements and the labyrinthine atmosphere of the Super Metroid. Ironically, anyone who played through the opening scene of Castlevania: Symphony of the Night has played a portion of Rondo of Blood. Symphony of the Night is simply a continuation of Rondo of Blood’s storyline. Unfortunately the Turbo Grafx-16 did not garner the same amount of success as the PC Engine did in Japan. A five-year death spiral followed the system’s release, ultimately culminating in its discontinuation in 1993. In fact, NEC sold only 2.5 million consoles in the U.S. during this brief run. Compare that to the Sega Genesis that sold 14 million in its entire lifespan. There are a myriad of reasons behind the TG-16’s failure on the North American market. Some of these stemmed from boneheaded decisions on the part of NEC, while others were simply a result of bad luck. The TG-16 had the misfortunate of launching two weeks after the Sega Genesis. Whereas the American public had passing familiarity with Sega through the Master System, NEC was a newcomer whose reputation as a computer manufacturer did not hold the weight it did in Japan. In addition, the company was unprepared for its rivals’ giant marketing power. Sega and Nintendo’s popularity allowed them to acquire a wide breadth of support. The Genesis, for example, had a lot of third-party support from recognizable companies like Electronic Arts and successful franchises like Madden. Moreover, the NES – with its huge install base – still had some of its best years ahead of it; Super Mario Bros. 3 and Castlevania 3: Dracula’s Curse were both released in 1990. The TG-16 lacked recognizable franchises compared to its competitors. Both Mario and Sonic the Hedgehog overshadowed franchises like Bonk and Bomberman. Most notably, the system’s pack-in game, Keith Courage in Alpha Zones, was an ill-advised choice that paled in comparison to its rivals’ equivalents. Also, while not a detrimental factor, the Turbo Grafx-16’s games generally had bad cover art. It is easy to imagine a young video game player circa 1990 passing over a TG-16 title at Wal-Mart or Radio Shack due to a bland cover. The system’s hardware was also an issue. The games looked comparatively archaic and played slower than its rivals, and this only became more apparent when the Super Nintendo debuted in 1991. The original TG-16 only supported RF modulation, which meant no stereo sound. The console required the purchase of an extra peripheral, the Turbo Booster, to use AV cables – a feature readily available in other consoles like the Super Nintendo. 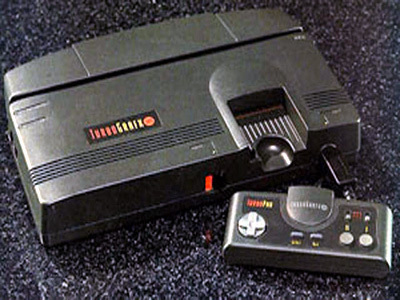 The TG-16 came with only one controller port, meaning player were forced to purchase the Turbo Tap peripheral if they wanted to play games with friends and family. The only saving grace is that the Turbo Tap also functioned as a multi-tap, allowing from 2-5 players. Additionally, the much-touted Turbo Grafx-CD expansion, which could have been the system’s saving grace, was prohibitively expensive at $399. To make matters worse, it was only widely available in major cities. Ultimately the TG-16 had a lot of the same problems that plagued the Sega Genesis later in its lifespan; to get the most out of the system, gamers were forced to buy additional peripherals. If you wanted to play with more than one player, then you had to buy the Turbo Tap. If you wanted to save your game, you needed the Turbo Booster Plus. If you wanted to play the CD games, then you needed to buy the Turbo Grafx CD expansion. Simply put, it’s perfectly understandable why someone would want to stick to a console that was playable right out of the box, and that factor was a major part of the console’s demise. The Turbo Duo, a system that combined both the Turbo Grafx-16 and CD expansion units into one, largely solved this dilemma. Unfortunately it came out in late 1992. By that time the Super Nintendo had already been released, and NEC’s share of the market was a distant third or fourth. Up until recently, if one wanted to experience the Turbo Grafx-16 it meant tracking down a used system (not to mention the numerous peripherals) and paying inflated prices on eBay. Acquiring a Turbo Grafx-CD expansion or Turbo Duo was an even more difficult proposition. Luckily, with the advent of the Wii’s Virtual Console, most of the TG-16’s popular games have been preserved for future generations of gamers. Indeed, many of these games – particularly the “shmups” – still retain their fun factor. The Virtual Console’s library even includes some TG-16 games that never made it to the U.S., such as Bomberman ’94. At around 600 Wii points a pop, it’s certainly worth trying out some of these out- a great way to celebrate the 20th anniversary of a long-forgotten, classic console. ← BITMAPS 89: Get With The Times!